I really like the taste and texture of red lentils and I've been cooking them (sometimes together with rice) as a side dish or as part of the main dish. However, I wondered if and how you would go about frying them. I'm thinking that maybe the straightforward way of just throwing them into hot oil wouldn't work if they're raw, right? So do I have to soak them beforehand? Should I cook them first? With all dried beans, they should be cooked first. Lentils do remarkably well cooked as rice, which is why they're often paired with rice. A rice cooker set with just lentils, or your favorite pan-rice recipe should work. Lentils don't need to be cooked as long as other beans, so you shouldn't need to pressure cook them, or soak them, like you would other beans. You can then sauté them in oil, if that's what you want to do. Frying (deep-frying) is not what I would expect with lentils; they sauté well, however. I cook with red lentils a lot and they are always cooked by some means of boiling, whether in water by themselves or with stock as part of a something else. If you wanted to fry them on their own I would think you'd need to cook them up in water first to soften them, then shallow fry them, maybe with some onions in, a bit like a dahl. Not the answer you're looking for? Browse other questions tagged frying lentils or ask your own question. What made these red lentils 'brick' together? What ratio of rice is needed for lentils to be a “complete protein”? 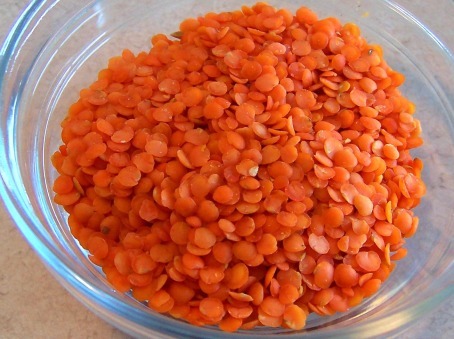 Are red lentils and split red lentils the same?